With all this talk of Soundcloud going down the drain, the one thought that happened to cross my mind was -- wait, what would happened to Acid Rap and 10 Day? Chance the Rapper independently made his come up through Soundcloud and constantly tells of how his first two mixtapes are only available on the site. However what happens when the company slowly starts to crash and burn? 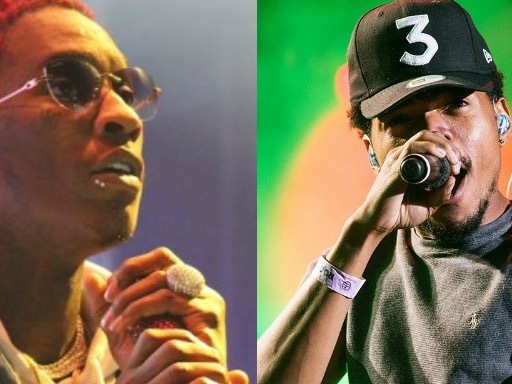 Chance drops a new track featuring Young Thug - that's what happens. Of course Chance could simply not sit and watch while his favorite music platform fell by the wayside. So, in typical Chance fashion, he tweeted out to his fans asking them who they have discovered through the site, and what their favorite "Soundcloud songs" are. He even tweeted that the site is "here to stay" reassuring fans that it wasn't going anywhere. *airhorn* Spread the word: your music isn't going anywhere. Neither are we. This site was where his music was born and where he first started to get noticed, and so what a better time to make a track with Young Thug titled "Big B's" that is essentially a tribute to SoundCloud? The song sounds like a pre-Coloring Book Chance. And as for Young Thug it doesn't feel like the music that he usually puts out, either. Nonetheless, the collaboration was a good idea for both artists. They both have different styles and were both able to feed off of each other with their clever lyrics and storytelling. "Gross 3 mill off the new hat, if I could go back I make the two cap," Chance says in a verse. The song now has 2.07 million plays on SoundCloud and has only been up for five days, so who knows if this will help "save" SoundCloud. It seems like Chance the Rapper fans will follow him wherever he goes, and maybe this will help the site stay around longer.